Falcon cottage is a quintessential ‘chocolate box’ cottage. 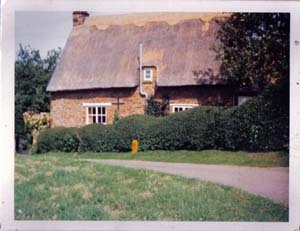 Tiny but well proportioned, thatched, with a pretty garden and by dint of it’s position, the ability to creep up and surprise the casual walker passing through the village. For the last 37 years the cottage has been home to Nancy and her beloved husband Leo Kuzmicki, who sadly passed away on 22nd May 1982 aged 71. 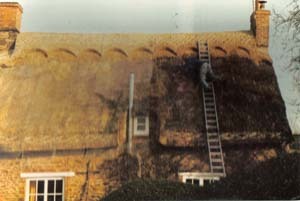 Nancy continued to live in the cottage that they had both loved until her death on 7th June 2005. She was 85. After she died, relatives found a document that had been put together by the husband and wife to record bits of history about their home. The following is a transcription of that document. This cottage appears on a map of 1725. In 1933 it was auctioned by the trustees of the Fawsley Estate. It was purchased by Mrs Betty Shepherd, used by her family as a haven from the London bombing during the war of 1939-45, and named “The Bolt Hole”. In 1968 we arrived and decided to change the name because the popular press was still concerned with “The Great Train Robbery” and was certain that the culprits were “lying low in a bolt hole somewhere”.